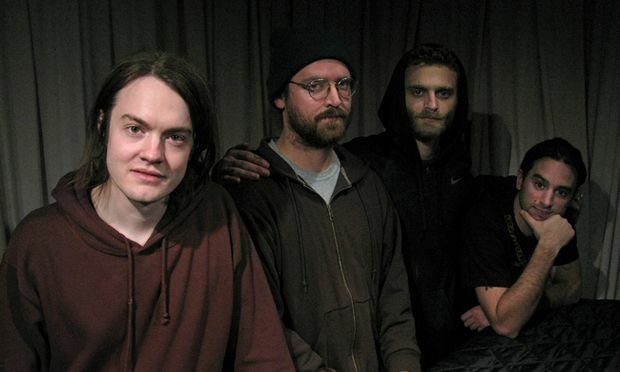 David Garland interviews my son’s black metal band Liturgy on Spinning on Air. At the end, all the band members say hello to their moms, over the radio. That’s Bernard, second from left. Congratulations, Bernard! And don’t feel slighted, Kyle; I guess black metal musicians are just mama’s boys. Thanks for providing this introduction to some fascinating music and commentary. One of my initial thoughts was to discern any possible connection to earlier bands, and without knowing anything about the group, The Who first flashed through my mind, and I also had a glimpse of Mountain, and a British band that made innovative use of dramatically powerful drones. It also occurred to me to suggest to Jerry Brown to commission this group to compose and perform some form of rain chant here in California, which was a half-serious if complimentary thought. Then, unexpectedly, I heard rather dramatically in the music, raw pathos and rage for the manner which older generations are destroying Mother Earth with unnecessary forms of energy. As my late friend, Ray Manzarek’s friend and bandmate, Jim Morrison, once despaired: “What have they done to the earth? What have they done to our fair sister? Ravaged and plundered and ripped her and bit her Stuck her with knives in the side of the dawn And tied her with fences and dragged her down.” I feel better knowing these guys are making their music. KG replies: Sorry for the delay, just extremely busy.